Pahrump, NV, 60 miles west of Las Vegas, is a wonderland for photographers. Located in the Mojave Desert and surrounded by mountains, it offers a variety of subject matter for camera bugs. Whether you are a professional or do it for fun, follow our map to some of the most photographed places in the area. The Museum is located at 401 E. Basin Rd and is open Tuesday through Saturday from 9 am to 5 pm. You can call them on 775-751-1970 to find out about Sunday schedules. They are closed on Mondays. The Museum and Historical Society were founded to preserve the history of the land and heritage of the people of the Pahrump Valley. They have collected artifacts, documents, and many other items depicting the story of how Pahrump came to be, from the Native Americans who first called this home to the townsfolk who live here today. Photograph historic buildings, mining and farming equipment of days gone by, and other period pieces belonging to or donated by the founders of the community and long-time residents. Voted the best Nevada Winery 2015, 2016, and 2017 and recipient of 107 National Wine Awards, Pahrump Valley Winery is located at 3810 Winery Road. Wine Tasting is from 10:30-5:00 daily. The winery is also home to Symphony’s Restaurant, open seven days a week for lunch from 11:30 am to 3 pm and dinner 5 pm – Close (about 8 pm or so). Dinner reservations can be made by calling 775-751-7800 or 800-368-9463. The winery is surrounded by vineyards, flowers, a lawn area with a gazebo and mountain views. Perfect for taking photos. As the light changes throughout the day, photos take on a new life. If racing and action shots are your thing, stop by the Pahrump Valley Speedway for some exciting scenes. You’ll find their race schedule on their website at pahrumpvalleyspeedway.com. They are located at 300 N. Panorama Rd. in Pahrump. Racing season is from February to November, every other Saturday night. The track is one of the remaining clay-based tracks in the country. The divisions of racing include: Bomber, Coupe, Modified, Mini Stock, Hobby Stock, Super Stock, Sports Mods, and Mini Dwarfs. If you want to be a part of the activities, bring your lawn chairs and the whole family to join in the fun and get those once in a lifetime action photos. Food and drinks are available at the speedway. There is another racetrack in Pahrump with an entirely different kind of racing. This is the Spring Mountain Motor Resort and Country Club, home to the Ron Fellow Corvette performance driving school and the New Cadillac V-Performance Academy. It is located at 3601 NV Hwy 160 in Pahrump. Included on the property of the racetrack lies Lake Spring Mountain, where they offer water sports and white sand beaches. In the middle of the clear blue lake is an island lined with trees, perfect for water-related photos in the middle of the Mojave Desert. You can relax at the Tiki Bar in between photo shots and enjoy watching visitors play volleyball, swim, and lounge in the sun. It’s a chance to photograph those willing to try the jetpacks, kayaking, paddle boards, and other water toys. If you’d prefer landscape photos, then the lake and surrounding mountains offer beautiful scenery. The lake is open to the public on Saturdays and Sundays from 10 am – 6 pm from Memorial Day to Labor Day. Another surprise in the Pahrump Valley desert is Mountain Falls Golf Course, located at 5001 Clubhouse Drive, Pahrump, just off Highway 160. This spectacular 18-hole course is called Nevada’s Desert Jewel for a reason. It is built around a natural spring with waterfalls, lakes, desert surroundings, and plenty of mountain views. In addition to championship golf, it’s the perfect setting for weddings, receptions, and many other types of celebrations. The Pahrump weather is conducive to outdoor photography, and Mountain Falls offers you the location. The continual deep blue skies in contrast to the velvety green grass are perfect for breath-taking photos. The course was designed by Cal Olsen who took total advantage of the surrounding beauty. Stick around for the sunset, and you can add brilliant pink, red, and orange skies to your backdrop. If you’re an RVer and looking for a picturesque place to stay for a few days while you explore Pahrump with your camera, then Lakeside Casino and RV Resort should be high on your list. With RV spots located all around the lake and among the trees, you’ll have ample opportunities to take some awesome photos. There are several fountains in the lake with mother nature providing natural beauty all around. Enjoy the lush green and grassy landscape, mountain views, and local wildlife. The close proximity to the other photogenic locations around town is a bonus. Lakeside is a perfect home base while you’re staying in town. It is located at 5870 S. Homestead Road. In addition to the ample photo opportunities, this park has a Good Sam rating of 10-10-10. Built in the Renaissance style of an Italian Tuscan Villa, award-winning Sanders Family Winery can be found at 3780 Kellogg Road, Pahrump. Surrounded by blue skies, mountains, and vineyards, this winery offers photographers the unique feeling of wineries of yesteryear. At the entrance to the property, you’ll be greeted by the statue of Teresa Lilianna, “The Wine Pourer.” You’ll travel through the gates and drive through the vineyards to find a large courtyard as an entry to the winery. Here, the owners provide weekend outdoor entertainment, often brought up from Las Vegas, during the warm summer evenings. You’re welcome to take a tour of the winery and watch as they hand cork the bottles. Some of the furniture found in the tasting room belonged to Bugsy Siegel, one of the most infamous and feared gangsters in Las Vegas according to an FBI report. Sanders, the owner of the winery, hopes to eventually develop a wine museum depicting the history of winemaking in the Pahrump Valley. Located on Highway 374 just off of Highway 95, about four miles west of Beatty, NV, you’ll find the ghost town of Rhyolite. Here you’ll discover the remnants of one of the many former mining towns in the area. At one time there were three railroads to the town of about 10,000 people. But the boom didn’t last as the gold was difficult to extract from the rock. If possible, an afternoon visit will provide excellent light on the remains of the town. Some of the buildings which remain include the three-story Cook Bank, a Las Vegas & Tonopah Railroad Depot, a bottle house, and a jailhouse. Rhyolite is one of the most photographed ghost towns located in Nevada. As you enter the ghost town of Rhyolite, you’ll encounter a unique art museum in the desert. Goldwell Open Air Museum is precisely that…it’s an outdoor sculpture park and is accessible 24/7. There are seven unusual pieces of art including “The Last Supper.” There is also a Sculpture Park Visitor Center and gift shop showcasing original art. The center is open from 10 am to 4 pm most days except Sunday. Because of the heat in the summer, they usually close by 2 pm. Ever heard of the Devil’s Hole Pupfish? It’s a tiny fish that only lives in a limestone cavern called Devil’s Hole. It’s located in Ash Meadows National Wildlife Refuge just outside of Death Valley, CA. There are several other animals and plants within the refuge which don’t exist anywhere else in the world. Ash Meadows has numerous natural springs and is often referred to as the oasis in the desert. It’s a unique ecosystem and is an invaluable place to study global conservation and to photograph. There are boardwalks strategically placed allowing you to hike throughout the meadows without damaging any of the landscape. The colors in the springs are brilliant, and you can see all the way to the bottom. It’s an excellent place for wildlife and bird watching as well as discovering plants unique to the area. Be sure to visit gunslinger Jack Longstreet’s stone cabin. 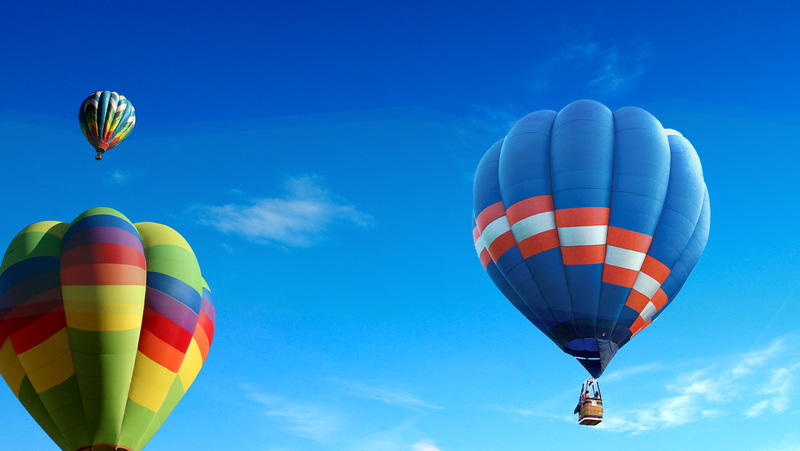 Take advantage of this unusual setting to get some rare photos. Stop by the brand-new visitor center to learn the best places for photo opportunities and to discover what’s available throughout the meadow. What can you say about DVNP? It’s spectacular! Not only that, it was Ansel Adams favorite place to photograph. 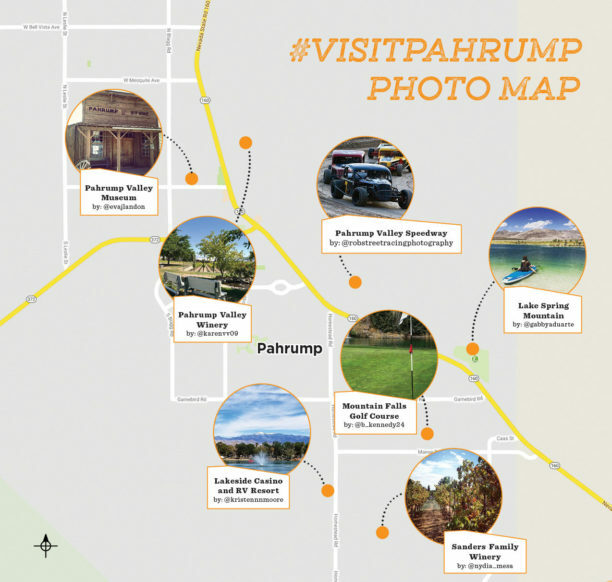 There’s no place like it in the world, and it’s right in Pahrump’s backyard. Drive about 60 miles to the land of extremes; hottest, driest, and lowest. Surrounded by stunning landscape as you drive through the 5,262 square miles of the park, you’ll have endless opportunities to take pictures. But be sure to bring plenty of drinking water and a full tank of gas and if you go in the summer, be prepared for scorching temperatures. Stop at the Furnace Creek visitor center for maps of the park and find out where the best photography spots are located. Be sure to talk to the park rangers to find out conditions and if any special requirements are necessary to visit these spots. While you’re in Furnace Creek, don’t miss the recently renovated Four Diamond Inn at Death Valley, formerly known as Furnace Creek Inn. Built in 1927, The Inn has multiple photography opportunities including gorgeous sunsets. Stargazing at night is also popular throughout the park because of the absence of lights. Night time photography is exceptional. In the winter, the weather can change quickly so you’ll want to be prepared. Observe warning signs throughout the park. Also, a part of Death Valley, Badwater Basin, or sometimes referred to as Badwater Salt Flats, is the lowest place in North America at 282 ft below sea level. A boardwalk takes you out to the center of the basin and marks the elevation. You can look back across the road to see another marker on the cliffs marking sea level high above your head. Mother Nature forms unique patterns on the floor of the basin which lend themselves to artistic designs and great photos. Depending on the weather, these patterns continually change. Arriving there at sunrise or sunset is the best time to take advantage of natural lighting. Three miles north of Badwater, a spur road takes you to The Natural Bridge Canyon. It’s a 1.6-mile dirt road followed by a half-mile walk to get to this location. Check with the park rangers for the condition and difficulty of the entrance to this canyon. This amazing opera house is located in the small town of Death Valley Junction, CA, about halfway to Death Valley, or 30 miles from Pahrump at the intersection of SR 190 and SR 127. It is now on the register of historic places. Marta Becket spent nearly 50 years entertaining and sharing her art with visitors to her town in this opera house. The building was formerly the recreation center in a company town developed by the Pacific Coast Borax Company in 1923-24. Marta Becket was an actress, dancer, choreographer, and painter who performed on Broadway and at Radio City Music Hall. In 1967, she left New York with a one-woman show that she took across the country. She discovered Death Valley Junction due to a flat tire while on tour and decided to stay. She rented the recreation center and revamped it into an Opera house where she started entertaining to an empty house. She changed the name to The Amargosa Opera House, and in 1970, National Geographic journalists discovered her. She also appeared in Life Magazine, and soon she and her opera house became internationally known. She entertained people from around the world including celebrities such as Ray Bradbury and Red Skelton. Her last performance was in February 2012, and she passed away in January 2017 at the age of 92. Becket personally painted the murals on the house walls of audiences enjoying the show. She also created her own sets for her performances. The opera house is still in use, and the tradition of Marta Becket continues. It’s an excellent venue for some unique photos. You wouldn’t expect to find a date farm in the middle of the Mojave Desert, but that’s exactly what you’ll find at China Ranch. 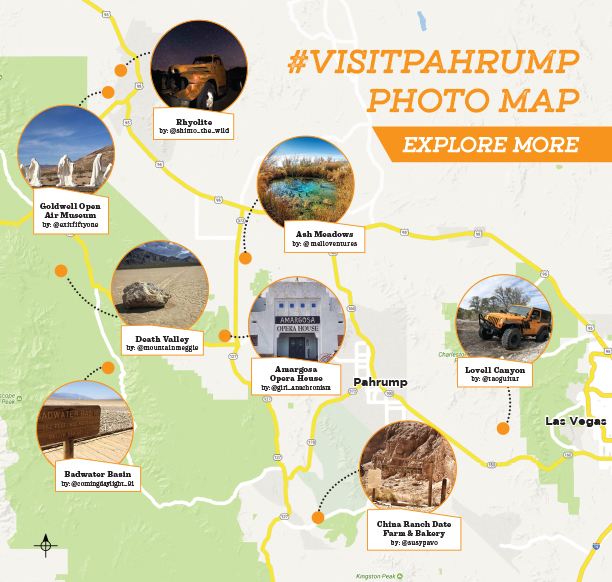 Located near Tecopa, CA, it’s a 42-mile drive from Pahrump. The ranch is family owned and rich with history and beautiful oasis-like surroundings. Tour the date orchards, visit the gift shop, try some date breads and cookies, and by all means…taste one of their infamous date milkshakes. A hike around the area will take you to old mines, part of the Old Spanish Trail, Tonopah and Tidewater Railway beds, and you’ll see plenty of antiques from the mining days. They offer interpretive nature walks as well. The road leading to the ranch is also unique in that it’s cut right through a mountain. The road twists and curves its way down to the ranch and is partially paved with the rest gravel. The drive down and the ranch both offer opportunities for some out of the ordinary photos. Lovell Canyon is located on the southwest end of the Spring Mountain Range. It’s one of the best hiking and off-highway areas and offers beautiful photographic scenery. You can find the turn off of Highway 160 about 38 miles south and west of Pahrump. After driving about 11 miles, you’ll come to the Torino Ranch Gate. To the left, you’ll find Lovell Summit Road. In approximately .4 miles, you’ll come to a parking lot and a kiosk with information about the canyon and three hiking trails. You’ll find yourself in the backcountry of the Red Rock Canyon National Conservation Area (BLM Land) and the Spring Mountains National Recreation Area (USFS Land). Enjoy views of Mt. Charleston and the surrounding mountain ranges and valleys. We’ve covered a lot of territory but have shown you where to find some of the best locations for taking pictures. Get away from the big cities and record some of the most unique and beautiful areas within and around Pahrump, NV…just 60 miles west of Las Vegas.